Ruth is seen in the above video with her third left, and second right orthotic device. Serial orthotic corrections are used with some patients since their feet are so flat, and the complete correction so drastic a change, that intermediate steps are taken. Hopefully you can tell by the video that complete correction is attained on the right with 50 degree inverted orthotic device (giving 10 degree inverted heel change) and 1/4 inch varus midsole wedge (giving 2-4 degrees inverted heel change). 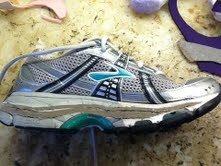 Since Ruth started out at 12 everted resting heel position, adequate correction was attained. Her right heel now stands 1-2 degrees inverted to the ground. Ruth's left heel started 17 degrees everted. 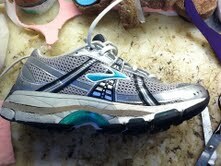 Her third orthotic device on the left side was 60 degrees Inverted (giving 12 degrees of heel inversion). 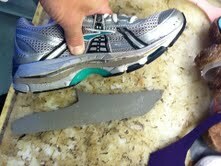 The initial 1/4 inch varus midsole wedge gave 2-4 degrees of inversion, leaving her left her 1 to 3 degrees off vertical. At the time of the office visit, I increased the shoe midsole wedging another 1/8 inch (giving 1-2 degrees of correction).This left side is so so close. The pain she gets in the medial arch is reduced by the reduction in pronation, but also in the accommodation of the plastic area below the sore spot under the first metatarsal-cuneiform base. 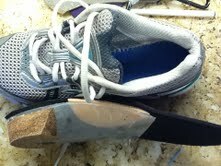 The 1/4 inch varus left midsole wedge is deemed inadequate support while watching Ruth walk. Just above the wedge, the midsole is cut from the heel to the toes and a 1/8 inch additional wedge beveled along one edge. Here the cut and additional wedge is noted. 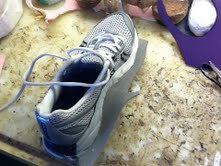 After both the shoe and wedge are glued, and the glue is left to air dry for 5 minutes, the initial wedge is placed into the midsole of the shoe. 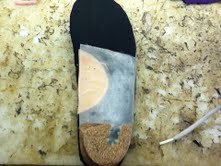 The additional 1/8 inch midsole wedge is glued and then Superglued to the shoe. 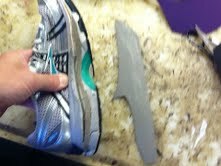 You can see I let the shoe wedge go further out towards the toes since Ruth seemed to be pronating more when her weight went in front of the original 1/4 inch wedge. To help with the pain at the base of the first metatarsal-first cuneiform, the plastic is thinned and 1/8 inch pink plastazote (memory foam) is layered between the plastic and topcover. Here the side view of the plastazote layering. 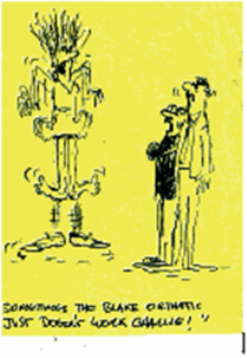 Support Hose: Always check for leg indentation! !